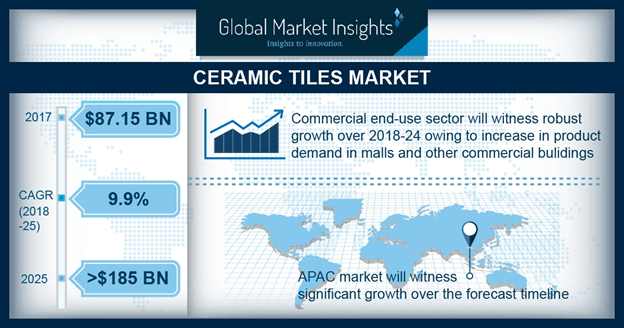 Ceramic Tiles Market size is forecast to exceed USD 185 billion by 2025; according to a new research report by Global Market Insights, Inc. The other segment in ceramic tiles business includes ceiling tiles, roofing tiles and countertop tiles. Ceramic ceiling tiles are widely employed in bathrooms. Usage of ceramic tiles on shower ceiling is an ongoing trend, which is likely to continue during the forecast timeframe. The product usage as roofing tiles helps in preventing the rainwater from seeping into the house.